Democratic Senate candidate Beto O'Rourke speaks during a campaign stop at Cine El Rey on Saturday, August,18, 2018, in McAllen. McALLEN — There was a time when Beto O’Rourke, the Texas Democratic Senate candidate, could walk into Rio Grande Valley hotels and restaurants undetected. Not anymore. Saturday, shortly before his campaign rally at Cine El Rey, O’Rourke stopped at a nearby Taco Palenque for lunch when a mother and daughter asked for a photo. Soon after, upon parking his Toyota Tundra pickup truck on 17th Street, people shook his hand, waved flags and asked for pictures. One man with a flag hugged O’Rourke and it seemed as if he’d never let go. But O’Rourke had a brief television interview to conduct. 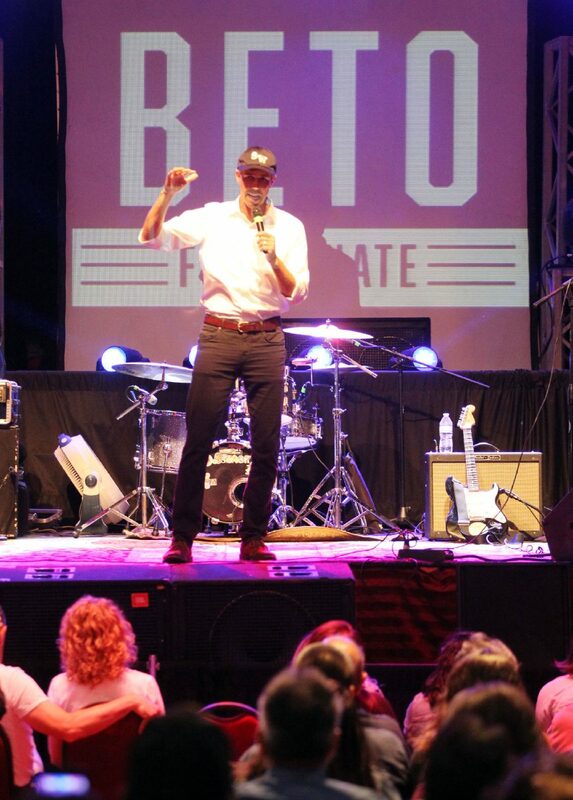 Beto O'Rourke during a campaign stop at Cine El Rey on Saturday, August,18, 2018, in McAllen. “You can join me for this interview if you’d like,” he said. O’Rourke is running to unseat incumbent U.S. Sen. Ted Cruz, who was the Republican runner-up to Donald Trump in the 2016 presidential election, something the El Paso congressman made sure to point out during his speech as a failure to focus on Texas. However, because of his robust yet unsuccessful presidential run, Cruz doesn’t have a recognition issue. And despite Saturday’s rowdy crowd inside and out of Cine El Rey, not everyone knew O’Rourke. Adam Adriao drove by and was curious about the commotion. He had never heard of O’Rourke. “I’m gonna look him up though, see what’s up,” Adriao, 38, said on the sidewalk outside the downtown venue. Inside the historic theater, the top Democratic nominees for statewide office spoke. Lupe Valdez, the gubernatorial candidate running against Gov. Greg Abbott; Mike Collier, the lieutenant gubernatorial candidate running against Lt. Gov. Dan Patrick; Justin Nelson, the attorney general candidate running against Attorney General Ken Paxton; Miguel Suazo, challenger to Land Commissioner George P. Bush; Joi Chevalier, the comptroller candidate running against Comptroller Glenn Hegar; and a couple others were all on hand Saturday. They introduced themselves, some needing longer introductions than others. This was new, O’Rourke hasn’t campaigned alongside other Democrats running for statewide positions. The other candidates can only benefit from O’Rourke’s crowd, which they knew wasn’t for them. O’Rourke signs, apparel and memorabilia filled the standing-room only audience that overflowed into Suerte Bar & Grill next door, which live-streamed the rally. 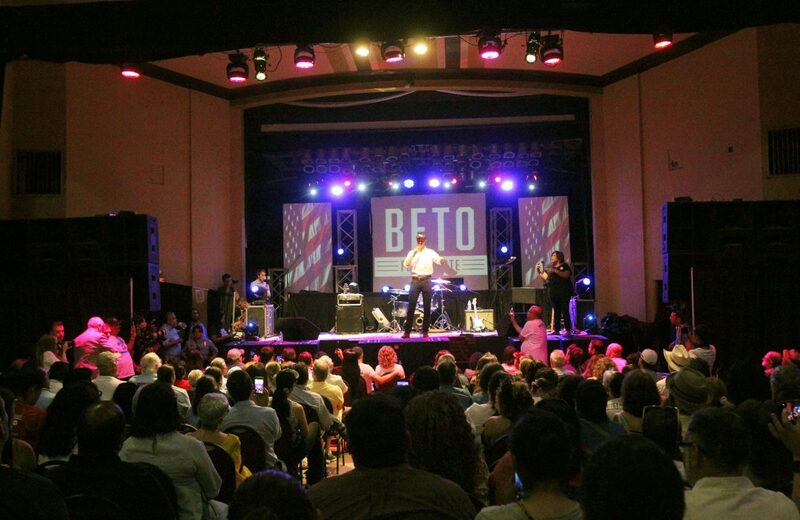 Between the Cine El Rey and overflow crowd at Suerte, O’Rourke’s campaign said there were 850 people in attendance. One of those people was related to the original owner of O’Rourke’s baseball cap. In May, during a stop at a Stripes convenience store in the Valley, O’Rourke ran into a retired local football coach. After chatting, the two exchanged hats. Robert Villarreal, a former PSJA Southwest football coach, received O’Rourke’s Houston Astros cap while O’Rourke took the navy blue cap with “SW” etched on the front. O’Rourke kept the hat in his pickup truck ever since and wore it during Saturday’s rally. Patti Villarreal, Robert’s wife, called her husband after posing for a picture with O’Rourke and handed her phone to the candidate. The two talked before Robert drove over to take a photo with O’Rourke. Same Astros cap. Earlier, Patti said she enjoyed O’Rourke’s positivity and enthusiasm. Others in the crowd did too, especially when welcoming O’Rourke with a standing roar. O’Rourke did not, however, field questions from the audience as he normally does at campaign events. The crowd took in a hearty warm-up from the other Democratic candidates and a quick stand-up set from comedian Cristela Alonzo, a San Juan native who now lives in Los Angeles and has a Netflix special. Alonzo has served as O’Rourke’s driver during his mid-August South Texas swing, which featured Laredo, McAllen and Brownsville this weekend. O’Rourke signed memorabilia and posed for photos with people young and old on the patio of Suerte, where the line snaked around the bar, which was open. While waiting for photos with O’Rourke, supporters indulged. The campaign figured that may be the case. After a photo with O’Rourke, Oscar Vicente Gonzalez, a supporter from Starr County, grabbed his Tecate Light. No open containers on the street. “Let me chug this before I go,” he said. And before tossing the bottle, Gonzalez slipped off the “Beto for Senate” koozie to take home. “Can’t forget that,” he said.